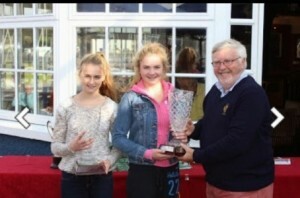 The Royal Cork Yacht Club was buzzing at the weekend, with what was a great precursor to next year’s dinghy week. The RS fleets were in town for their final event of what has been a bumper Irish calendar full of well attended competitive and fun events. Tents were being welcomed and pitched on the lawn, and dinghies were arriving in great numbers on the Friday night and Sat morning. The weather was playing ball and giving us wind and the impression that it was still summer. The red carpet was rolled out by a club that draws on its people and facilities to run top class events in a really friendly way. Small details make these occasions and there was little left undone, with shore helpers and soup waiting at the top of the slip for competitors, and a few free pints to help ease the aching bones on the Saturday night. Results were hitting the website as the boats were finishing, just another detail that makes a noticeable difference. Barry Rose was our race officer and employed the great help of a top notch team, including Ciaran Mc Sweeney who had ran an excellent RS sprint event earlier in the year out of MBSC, and RCYC’s Eddie Rice who along with the rest of the team provided exceptional racing, with no delays of any kind all weekend. The course was changed so fast when needed that the competitors hardly noticed, and everything from course length to the quality of the line was impeccable. The 40 teams in their double handed dinghies made a fantastic sight snaking out the Owenabue River and around Camden and then Roches to do battle on Sat Morning. When they arrived they found a course ready to go and once the last competitors had arrived, racing got under way in brilliant conditions that allowed for surfing downwind and good tactical upwind racing. Race one saw RCYC’s David Rose and Ian Hef lead the way for two rounds on home turf, until being reeled in and passed by John Downey and Sandy Rimmington (MBSC) and the ever present Sean Cleary and Steven Tyner on the final beat. Race two saw National Champions Alex Barry and Richie Leonard record a bullet followed by Dave Cheyne and Stephen Kane (NDLL) who would remain consistent for the remainder of the regatta and gain a podium position of 3rd place overall. Race three was all about Sean Cleary and Steven Tyner (GSC) who have had a fantastic season, including winning the Eastern’s and recording a very credible 10th at the UK Nationals. For most of the race, they were challenged hard by John Downey and Sandy Rimmington, but their challenge was to end abruptly in a post weather mark incident that resembled losing a front wing in a formula one car. When the dust settled John’s bowsprit was broken and they had to limp home in luckily for them the final race of the opening day. Overnight Andrew Alego and P. Nolan (RSGYC) were well placed as was Andy Verso and Oisin Baugh (GSC). The racing had been close and there was a lot to play for on day two. On day two Barry Rose decided that with a bigger swell and more breeze forecast it was prudent to race the fleet in harbour. Cuskinny is a great place to race with a strong easterly, and despite a more tidal race course, it was a great call, allowing the fleets to get in 3 more exhilarating races in great breeze, watched by a flotilla of motor boats and yachts that came out to see these exciting fleets in action. Alex Barry and Richie Leonard had a fantastic battle with Sean Cleary and Steve Tyner in race four, and this would prove to the be order of business for the day. 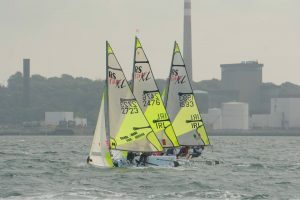 David Rose and Ian Hef were back in the mix recording a two and a three in race five and six to finish fourth overall. Dave Cheyne and Stephen Kane were excellent in the conditions and a third and two sixths would earning them a well-deserved third overall. For the top honours there was little between Alex and Richie and Sean and Steve, both teams battled hard all day, overtaking each other many times. This was a tight affair with no shortage of drama, including a swim in Race five for Alex and Richie, which they recovered from admirably. Sean and Steve on “Yachtsman Euromarine” were in poll position going into the last race, but the margin was slim and Alex and Richie knew if they could overhaul their competitors in the final race they would win on count back, and that is ultimately what happened. Alex Barry and Richie Leonard are 2014 Southern Champions. A good turnout for the final event of the season for the 200 fleet, made for some very competitive racing, and we may see a cork fleet develop next season in this exciting class. Ronan O’Driscoll and Shane Dunlea are sailing out of MBSC and many heads were turned in the Royal Cork at the weekend, by a boat that combines high performance and well worked out systems that are easy to use. Day one was all about Marty O’Leary and Rachel Williamson (RSGYC), who mastered the conditions and dominated the fleet with a clean sweep of three race wins from three on day one. Marty had made the move from competing well in the 400 with Brian Fenlon recording an 8th at the Nationals in Galway this year. Blair Stanaway and Heather King (RSGYC/Westport) were hanging in there with two seconds and a third to open, as were Stephen Craig and Conor Foley (RSGYC) with two thirds and a second. It was to be more of the same from Marty and Rachel on day two, recording an impressive fourth race win from four, before allowing Blair and Heather to win the fifth race. Marty and Rachel however had now won the RS200 Southern title with a race to spare in a superb first outing. Second was Blair and Heather two points back and third was Stephen Craig and Conor Foley a further five points adrift. The 200 is a newer boat than the 400 and has a lower weight band being similar but slightly less powerful. The fleet in the UK is very large and strong, allowing easy access to affordable and fast second hand boats. There are also demo boats available in Ireland so please enquire if you are interested in getting involved. We are expecting growth next year country wide in this exciting class. The Feva class was full of Royal Cork competitors, making up over fifty percent of entries. One of the bigger challenges of Day one was getting out to the race course through the tidal rush and sea one often gets in the entry to Cork harbour. Once out there, the Feva’s started an exciting series that saw Lorcan Tighe and Cian Murphy of NYC winning race one, with Dara Donnelly and Rosemar Tyrell (NYC/RIYC) second. Donnelly and Tyrell were to finish second in the other two races of the day and were level on points with Sarah Cudmore and Kelly Williams (RCYC) after day one. Sarah and Kelly won race two and three and established themselves as favourites. Day two, and to the in-harbour course and more wind. It was business as usual for Sarah Cudmore and Kelly Williams winning a further two races and taking the championship in fine style with a race to spare. Lorcan Tighe and Cian Murphey who sailed really well to three seconds on the Sunday were second overall, three points clear of Dara Donnelly and Rosemar Tyrell in Third. Suzi Fitzpatrick and Aine Riche (RCYC) won the final race to sit fourth. Other honours went to first lady crew in the 400, Laura Holohan, she finished sixth overall with helm Paul McMahon. Sheela Lewis took first lady Helm and 14th overall in the 400 (John Lewis crewing). In the 200 Sarah Byrne took top lady Helm (crewed by Tom Gillan) and champion Rachel Williamson also took home top lady crew in the 200 (Marty O’Leary at the helm).